Finnian was born in the latter part of the fifth century, at Myshal in County Carlow, on the slopes of Mount Leinster. His father was Rudraigh, an Ulsterman of noble lineage. His mother was a Leinster woman called Telach. Finnian's education begins locally, when he is taken to Bishop Fortchernn. This marks his first serious induction into the Christian Church and it awakens a hunger for more learning. It is this which drives Finnian across the sea to Britain, and further afield to France. The monastery at Tours is his first point of landing, and his experiences there shape his idea of religious life. Tours is noted for its austerity, for its sacrifice of physical comfort for spiritual gain. Finnian finds himself at home in this environment, the more so for befriending an elder called Caemen, with whom he studies. From his stay here, Finnian does not return directly to Ireland, but comes to Wales instead. This is a time of close links between the Irish Church and the Church of the Britons. Here, Finnian pursues his studies at the monastery of Cadog the Wise, at Llancarfan in Glamorganshire. He remains here for years, at prayer and study, growing in strength of spirit. When the time comes to move on, it is not to Rome, as Finnian initially intended, but to Ireland. He comes first to Aghowle in County Wicklow at the foot of Sliabh Condala, where he builds a church. Although dedicated to the kingdom of God, Finnian is not without power and influence in the world of men; Oengus, the king of Leinster, has no hesitation in granting him his site there. Obviously, this isn't the end of Finnian's journey. He is a driven man, and he travels north to Dunmanogue on the river Barrow, in County Kildare, where he establishes another church. From here, he goes to the town of Kildare, studying and teaching at St Brigid's monastery. Finnian is held in high regard by Brigid, who presents him with a gold ring on his departure. Finally, Finnian arrives at Clonard, between the kingdoms of Meath and Leinster. It is a good time to be in this place, as it amounts to little more than a wasteland at this time. There are no secular authorities to be negotiated with, and Finnian can simply commandeer as large a swathe of land as he deems necessary. Throughout all the time of his travels, the reputation of Finnian has grown and spread, and men come from far and wide to learn from him. 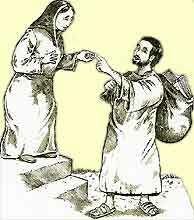 His gift for teaching, his ability to impress the great and good, and his absolute dedication to the ascetic ideal, inspire a whole generation. And as Finnian's reputation grows, so does Clonard. Those who live with him must live like him, and he is well known for his intolerance of self-indulgence. 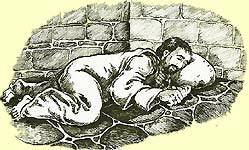 He himself sleeps on a cold floor, resting his head on a stone, and at all times, wears a girdle of iron as a penance for his body. Towards the end of his life, Finnian is struck down by plague, and moves out of Clonard to prevent infection to others. He moves to nearby Ross Findchuill, singing Psalm 132, "Here shall I rest". He knows his fate. Finnian receives communion from his former pupil, Columb son of Crimhthan, and thus at one with his life and Lord, departs this world.